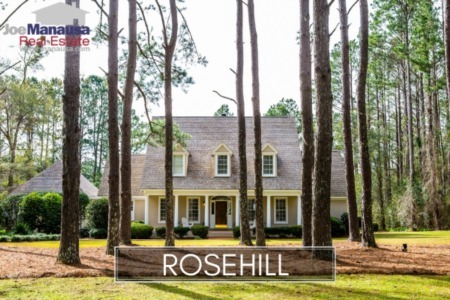 My concern for the health of the Tallahassee luxury homes for sale market has caused me to write several articles lately, and those articles have generated some stimulating questions from readers. If you read last week's blog post on high end homes last week, then you know that I believe the market for these homes might be at serious risk to rising interest rates. But a few readers were not as sure, and one even challenged me with an interesting question. 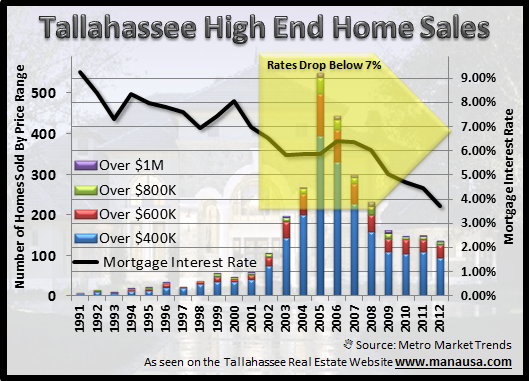 Do Mortgage Interest Rates Impact The Tallahassee Luxury Homes For Sale Market? Joe, as an owner of a nicer home in Tallahassee, I think you are overly concerned about rising interest rates. Won't rising rates have more of an impact on the market at lower prices, since most upper end homeowners pay cash? Well, this is a great question, and one that is not hard to answer. I went to the tax records and reviewed all arms length home sales purchased in 2012. 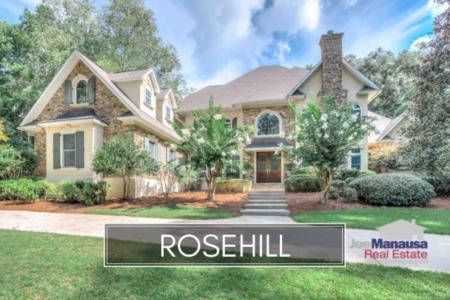 I have defined "Tallahassee luxury homes" as the group of homes that sold for more than $400K, which represents less than 5% of the market. 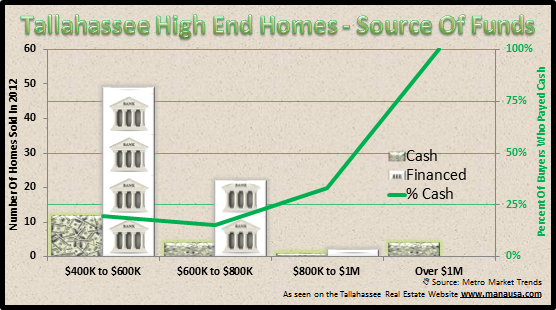 The real estate graph above shows that 100% of Tallahassee high end homes (over $1M) were funded with cash, while the majority of those purchased below $1M were financed. So, the answer to our reader's question might be dependent on how you define luxury homes for sale in Tallahassee. If we look at home sales over $1M, then 100% paid cash; but if we expand it to include all homes sold over $400K, then the percentage is reduced to just 22% (or roughly 4 out of 5 buyers financing their Tallahassee luxury home). So how do you plan for the future if you happen to own one of these Tallahassee mansions? The answer will depend on your particular situation. But if you believe that graph below is cause for alarm, then you and I are on the same page. The boom of the market in 2002 corresponded to interest rates dropping below 7%. I believe that the only reason the market for expensive homes in Tallahassee remains viable is due to the fact that interest rates have been held far below the 50 year average (8.7%). What will happen when rates push back up to normal? It's not like Tallahassee has seen a significant change in our economy, or a growth in local wealth. As we see mortgage interest rates begin to rise again, we will find a market that is heavily over-supplied with expensive homes. There will continue to be pricing pressure on owners of Tallahassee luxury homes for sale by owner and on zillow for many, many years. If you want more information on Tallahassee luxury homes for sale, just drop me a note and we can schedule a time to study the best options for your specific situation.